3 slices leftover sausage pizza, cut into 3/4 inch squares (or 3 cups) Whatever pizza you have left over is perfect! 1 clove garlic, minced (optional) I say add it in! Pepperoni slices or any other meat if you desire. I did not add any more, we had plenty this week! However, Canadian Bacon or some fried bacon would be yummy. Arrange pizza squares in prepared baking dish and top with mozzarella. Whisk together eggs, milk, onion, melted butter, garlic and oregano in a large bowl; pour over pizza. Sprinkle with Parmesan and crushed red pepper then cover with foil. Bake 30 minutes. Remove foil and top with pepperoni or other meat if using. Continue baking, uncovered, until eggs are set and Parmesan is melted, about 20 minutes. With everyone worrying about calories in my world I am going to start posting calories if noted in recipe. Per 1 cup serving: 446 calories. Have a piece or 1/2 a piece, it is worth it! Got a call from Martin in NYC today. He was attempting to make pizza dough. He made me realize I needed to update the instructions on this recipe. YIKES! Place dry ingredients in bowl of food processor or stand up mixer or mixing bowl if doing by hand. Pulse or mix the dry ingredients together. If using stand up mixer you can use the dough hook or the beater. Add water and oil slowly through the food processor tube or into the mixer bowl. Mix until a ball is formed. If doing by hand mix the ingredients together and place the dough on a floured counter. Knead the dough into a ball. Place some oil (1 Tablespoon) on counter and place the dough on counter. Roll in the oil and form into a small ball. Place dough in 2 quart bowl sprayed with oil. Cover with plastic wrap. Or, put in draft free area, let rise 2 hours and use that day. Put on your favorite toppings and bake at 475 for 10-15 minutes. Lily and Paige enjoy a restaurant in town called Rustique Pizzeria and Lounge. Believe it or not, I have never been there. Paige enjoyed the Veggie Lover’s Pizza. She requested this for New Years Eve but with the bad weather we ended up making it Friday. Paige, Rachel and I really enjoyed this pizza. Spread pesto over the pizza dough. Add the rest of the ingredients as you wish and top with cheese. I did not measure any of the ingredients. I think you got this!! Bake at 475 degrees for 10-15 minutes. The Friday Motley “Crew” begging! Eric wanted a Margherita Pizza and Lily wanted a Ham Pizza this week. I miss making different pizzas on Fridays. Lately we have been making the typical cheese and sausage pizzas on Fridays. I didn’t think the Margherita Pizza was much different from a cheese pizza but it definitely was. What a simple and delicious change from our usual Friday night pizzas. I checked out all the different pizzas I have done throughout the years on my blog this morning. I think I need to take an idea from my blog each week. Unbelievable how many different pizzas I have done through the years. If you don’t want to make your own dough you can buy it at the store. I make my own dough each Thursday evening. I put all the ingredients in my food processor and mix until a ball forms. Food processors are the best invention, ever! Place above ingredients in food processor (or stand up mixer or bowl and mix by hand.). Mix until ball forms or knead into a ball. Put teaspoon of olive oil on counter. Place dough on counter and form into ball. Spray plastic bag or bowl with cooking spray. Place ball of dough in bag and place in fridge. If you are planning on making that day place in bowl sprayed with cooking oil, cover and let rise 2 hours. Be sure to place bowl in warm place. If you decide to put in fridge take out a 2-3 hours before you want to use it. Preheat oven to 550 degrees or as high as your oven can go. Some can’t go that high. Be sure your pizza stone is in the oven getting nice and hot. Mix together the crushed tomatoes, minced garlic, olive oil, salt and pepper. I use a pizza peel. I place a piece of parchment paper on the peel and spread some semolina flour or corn meal on it. You can use all purpose flour too. If you don’t have a pizza peel, improvise. You could use a larger flat cookie sheet or back of cookie sheet. Advice – buy parchment paper. It is a life saver! Drizzle olive oil on the dough. Brush olive oil all over the pizza dough. Place the mozzarella cheese on pizza. Bake 8-10 minutes. Longer, if baking at a lower temperature. Take out of oven. You could add more basil, parmesan cheese or crushed red pepper to your delicious piece of pizza if you like. 1. I buy a large roast (5-7#), slow cook over night in the crock pot. (Or do during the day while at work.) I generously season with salt and pepper. (I will also use a rub it just depends on my mood and what I feel like doing that day.) When the roast is done I let cool down and then shred it. I freeze what I don’t use in small baggies. That way I have it for spur of the moment Purple Pig pizzas or pulled pork sandwiches. 2. Buy a 1-2# package of spare ribs. Preheat oven to 275. Place on baking sheet (or slow cooker). Season with garlic powder, salt and pepper. Cover with aluminum foil. Cook low and slow for 2-3 hours. The ribs are easy to shred. They fall right off the bone and work great with this pizza. I ended up doing this method yesterday and it worked out perfectly! 4. I take the shredded pork that I will be using for the pizza and mix barbecue sauce with it. It is up to your taste how much you add. 5. Combine the olive oil and minced garlic. 6. Brush the pizza dough with the olive oil/garlic mixture. 7. 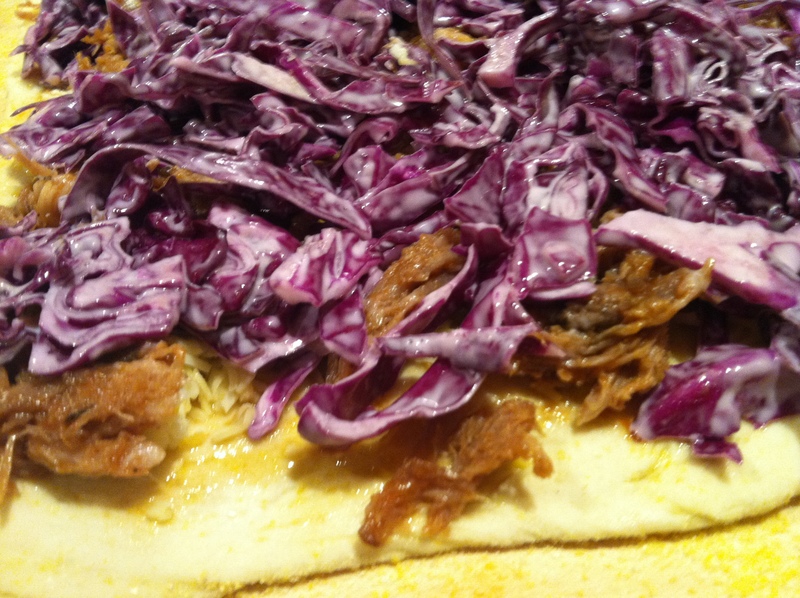 Add cheese, pulled pork mixed with the barbecue sauce and purple cabbage. 8. Bake at 475 degrees for 12-15 minutes. I am a fan of anything spicy, salty and drizzled with balsamic vinegar. Those combinations would be Pizza Verdure. Verdure means greenness of growing vegetation. So, as you must be aware there is no meat on this pizza. I am okay with that. Here is my version of this Simple and Delicious Pizza! For the Pizza Verdure; Mix olive oil and clove of garlic together. Use as your base on the pizza. I use a pastry brush to spread over dough. Layer the tomatoes, pepperoncini, olives, capers and provolone. On top of the provolone spread grated Parmesan cheese, rosemary, oregano and drizzle with balsamic vinegar. All I can say is AWESOME! Oh, so simple and delicious!! Eric suggested this for our Friday festivities. This was super simple and really delicious. Mix together butter and minced garlic. If you can put in fridge overnight that is great. Not necessary though. Spread garlic butter over pizza dough. Bake in 475 degree oven for 10-15 minutes. That’s it. DONE. OH MY GOODNESS. This is so easy and absolutely delicious. Just DO IT! Getting kind of bored with pizzas only on Fridays. Decided to shake it up a bit this week. I found this calzone recipe awhile ago at Cook’s Country website. I love muffaletta and thought this recipe sounded easy enough for a Friday night. It was a crowd pleaser and one to make again and again. We also had some delicious hamburgers, roasted potato wedges, deviled eggs and mini fruit pizzas. Something for everyone! Adjust oven rack to upper middle position and heat oven to 450 degrees. Arrange salami on large plate lined with paper towels. Cover with 2 more paper towels and microwave until fat begins to render, about 1 minute. Combine olives, red peppers, banana peppers and garlic in bowl. On lightly floured work surface (I line with parchment paper), roll dough into 14 inch round about 1/4 inch thick. Layer half of salami, mortadella, provolone, and mozzarella on half of dough round, leaving 1 inch border around edges. Spoon olive mixture over mozzarella and layer with remaining salami, mortadella, provolone, and mozzarella. Brush edges with water, fold over filling and crimp to seal. Brush 1 tablespoon oil over rimmed baking sheet. Transfer calzone to prepared baking sheet and cut four 1 inch slits on top of calzone. Brush with remaining oil and bake until golden brown, about 20 minutes. (I baked 20 minutes and it turned out great) Serve. I know it sounds like a lot of meat and cheese but it is the perfect amount. I promise you will not be disappointed. Enjoy!